…use her Grandmother’s tea cups more often. My pumpkin mug wasn’t clean this morning (dishwasher wasn’t full last night so I couldn’t justify turning it on) and that’s usually a sign of a bad morning. Then, when I opened the cupboard, I found that ALL of the coffee mugs were gone (how!? clearly resolution two for today is to find all of the coffee mugs) and that should have been the mark of a very, VERY bad morning. But in my search for a coffee mug, I found my Grandmother’s tea cups, 3 of which I inherited after she died in 1993. Hmmm, I thought, coffee in a tea cup? Why not? Best good morning idea ever. I mean, I definitely haven’t replaced my pumpkin mug (the sheer volume of coffee that mug is able to contain means it will never leave number one spot in my heart). 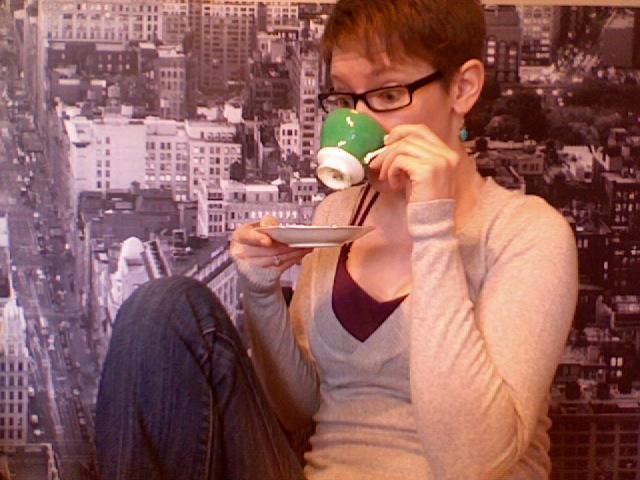 But this spiffy green tea cup is a close second. Right, off to do some work. I drink bourbon from tiny Japanse teacups even though I swore I would only drink tea from them. Thing is– I’m a North American who wants to drink a lot of tea and doesn’t want a lowball glass with the potential of pouring 8 shots of bourbon. I know my teacups only hold 2 shots, so I am safe. Drink out of whichever cup makes you happiest. Maybe you could put tea in your pumpkin mug. Shake it up! She would have loved this!! We used to have tea in her cups sometimes but not often enough.